Many shoppers find exceptional bargains at their local thrift stores. This is a guide about thrift store shopping tips. I was just reading the comments on the "Saving Money On Jeans" post, and I agree with the poster who said that Goodwill is getting "expensive"! There was a bigger, nicer Goodwill building built here in my city a few years ago, but on recent trips there, I've noticed that the prices are rather high (at least for a thrift store, in my opinion). My best friend used to work for them, and said that they often get brand new merchandise donated to them from Target and other stores. However, there are at least two other different thrift stores here in my city, and I know that at least one of them also gets donations from Target, and they have much lower prices. Once I bought a Target item from Goodwill, only to find it about $1.25 cheaper at Salvation Army! So my tip is to check out all the thrift stores in your area and compare prices. You might find some of the same items there, and get them cheaper than you would at Goodwill. I do still shop at Goodwill, but after I've looked at the other thrift stores first! Remember the Goodwill help others. Goodwill may be expensive, but they literally saved my ex-father-in-law's life when he was living on the streets about 30 years ago. Eventually he worked his way to becoming one of the higher-up's & started helping others (it's a very long story). So I just wanted to remind you, that when you shop at Goodwill, you are helping lots of people get back on their feet. Goodwill also helps the handicapped, both the physically handicapped and those with mental handicapped that can't get other jobs. Goodwill and the Salvation Army are a wonderful organizations & are having a very hard time this year because people that usually donate money don't have jobs & may need help themselves. Don't get me wrong, I always shop where the prices are cheap, but it does take a little bit of the sting out of the higher prices when you remember that you are helping others with the extra money you spend! 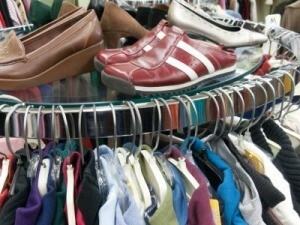 Another tip, look for other Thrift Stores that are run by volunteers working to help organizations like this. In Seattle we have a wonderful thrift shop that's totally run by volunteers that helps kids without money or insurance at the Children's Hospital Thrift Store. You can even get a tax credit if you donate to them. We also have several thrift stores run by local churches and one ran by the American Cancer Society. It's always nice to know you are helping others with your donations and your purchases. As a former Goodwill Production Manager I completely agree with you Lisa. Goodwill knows that people will keep shopping their stores so they will keep raising the prices. It has gotten out of control and outrageous over the past few years. They know it! I now shop at the local Habitat Store for a mere 10¢ on the exact same item at GW for $2.00. To me, it is worth the extra mile of gas to get the much better deals. I've discovered the St Vincent de Paul thrift store in our town to have excellent merchandise at great prices. In spite of the good I know Goodwill does (I'm a former client after a car wreck going on 7 years ago,) I've found their prices consistently too high. I used to donate to Goodwill on a regular basis - every time I cleaned out my closet or house. Last time, as I was pulling away from the behind the store drop off, I observed one of the employees throwing my NEW pair of woman's boots into the dumpster. I now take my donations to Salvation Army and shop there and church thrift shops avoiding Goodwill if at all possible. I have talked to the men from Salvation Army and they showed me how, when they have an abundance of clothes, they bundle extra items and ship to 3rd world countries to help them. Nothing is wasted. And, they keep their prices lower so others can afford to dress warmly and neatly. I have found that Goodwill & Salvation Army are entirely different even in the same city. Local managers have a lot of room to make changes and they usually do as they please as long as money is coming in. Gainesville, FL has a "new" Goodwill that looks like a dump all the time. Their Salvation Army is a true dump. Prices are still not cheap. Ocala, FL has a beautiful Salvation Army that sells great items but prices have recently gone up also. Goodwill here is known as the "Goodwill Boutique" because of the high prices. Another Goodwill sells everything by the pound so sometimes you can find a good buy but it takes a lot of time sorting through as lots of stuff is just thrown in "tubs". Bargains are usually found at church or true charitable thrift stores and some yard sales. It is also very difficult to find truly disabled workers at the Goodwill stores. I have been volunteering at a church thrift store for the last year .And for the last 6 months now, they have free stuff Mondays, (clothing,books household and more). And have given things for a lot of causes. Very nice and clean place and very low prices, 80% of all clothing is always .50 each. A real old fashion thrift, on the north side or racine, (revival thrift store). Communicating with Goodwill offices, I learned they are changing their marketing strategies due to the availability of new goods coming off shelves of failing/going out-of-business/bankrupt stores. I have found a plethora of NEW in-the-box with-the-manual items at tremendously low prices. I find NEW items: A Bodum cordless teakettle ($79) for $6, a pair of Stuart Weismann pumps ($400) for $3.99, a pair of Hush Puppies ($90) for $2.99, a Nordstrom leather vest ($189) for $2.99, a small (this was used) china cabinet ($2500) for $100, a kichen butcher block/island ($259) for $49, a vintage beveled mirror ($800) for $15. The mirror was too large, a leaner, and I sent it to a consignment shop who sold it for $300. I find Ralph Lauren, Liz Clayborne, Ann Taylor, Eddie Bauer, JC Penny, Target, Jones of NY, many, many famous top-of-the-line retailers at Goodwill. Just shop carefully. Goodwill needs cash. YOU need their stuff. Help them by recycling so they can continue their mission of helping the less fortunate and saving yourself money. 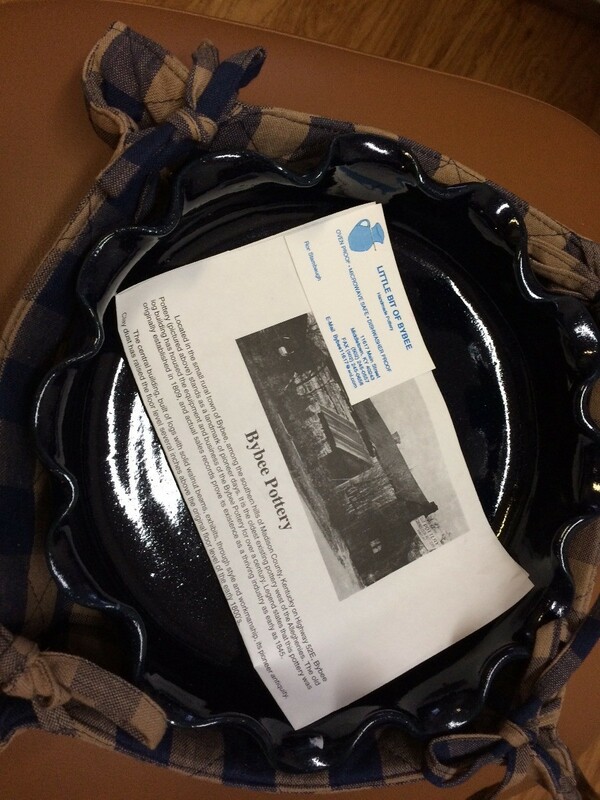 If I tire of an item, I donate it back to Goodwill. After all, I did not pay the true value and price for the item and some good comes of it once again when they resell it. RECYCLE, FOLKS! It is a good thing for planet Earth and you. Always check zippers on both leather jackets, skirts, jeans, and handbags. Make sure they are in working order, on track or if it's something easy like just sticking you know what you are dealing with so you can maybe get a deal, or at the very least, not over pay if they over-looked something. If you don't know how to fix or replace a zipper yourself, my alteration place has good prices, however sometime if you have to replace a zipper, it may well not be worth your find. If it's just sticking or jammed you usually can tell right away. Always make sure it's on track (the bottom isn't ruined). Zippers being stuck easily can be fixed with DW40; it works for me every time. That is what I would recommend, if its only a zipper that is sticking and it's something you want and worth the money. If the leather itself has a spot on it, it could save you money by pointing it out and be something you can fix. I have a great pair of boots that I tripped in the first time I wore them and tore the leather, making the toes look black, not the brown boots I had bought. Any craft store sells paint that is water proof, used for leather. Even if its an "off" color like mine was, I mixed 2 of the paints together and to this day only my son and I know it ever happened. So if there is a place on a bag, jacket, or pair of boots some of it can be redone for around $5.00 making it well worth it. When I say redone I don't mean the entire bag or jacket, I mean worn spots on the elbows, or spots of wear on a bag can be easily matched with this paint and made to look new again. Leather can be cleaned up and reconditioned in a few ways without costing you a bunch of money; talcum powder removes grease from leather, so just because there is a spot of oil or grease may not mean it's not worth seeing if they will give you a deal, or if it is a great deal may be worth a second look. Remember you can buy leather cleaners, water proof products, or if like me, use olive oil for cleaning and keeping my leather in soft, subtle shape costing hardly nothing. I have heard coconut oil works well. It comes in a jar and is very hard making it easy to put on a cloth and rub into the material. Also remember if it's brown, black, rust, or a color easily matched and has a small spot or maybe creases from prior use, shoe polish will soak into the spot, making it appear the same color. When using shoe polish on anything other than shoes, make sure you polish a couple of times, using a small amount each time and always getting any left over polish off. If you don't, it will come of on something you don't want it to; like your shirt, coat, etc. The liquid shoe stains do not do this. If using one of them make sure you have matched up the leather before applying. These things can also make an item you have look new again. I go to my local thrift store at least once a week. You never know what you are going to find. 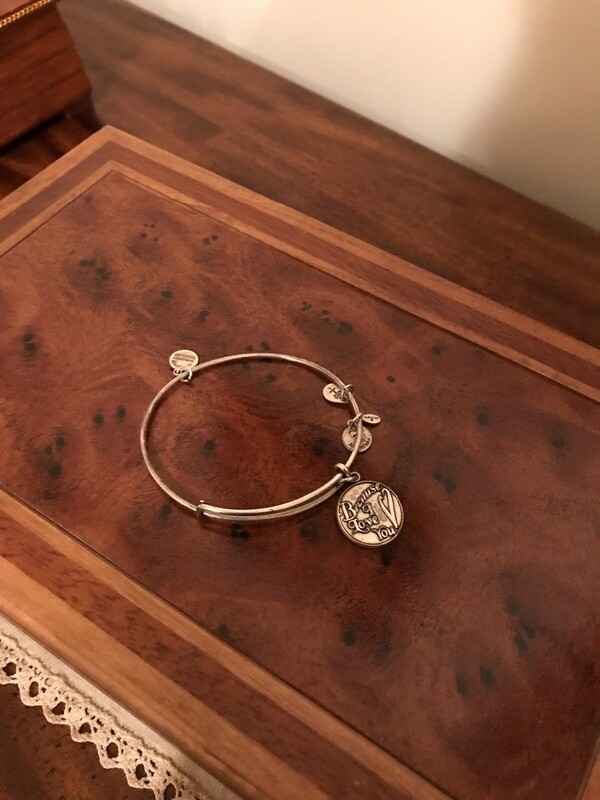 Today I found an Alex and Ani bracelet for $1, which my daughter will love. This bracelet would have cost $28 new. Every year Goodwill has a membership drive -I think it's in April. They sell memberships for $5. You will get 1/2 off anything you buy that day ,and they mail you 12 coupons good for each month of the year for $5 off any $10 or more purchase. I grew up in a family of 4 children, a stay-at-home mom, and a father who didn't make a lot of money. We had everything we needed but I did wear a lot of boys PJs inherited from my older brother and cousins. Think you can only get clothes and household items at thrift shops? There is often a lot of electronic and computer gear there, too. When our computer keyboard fritzed out last week, my hubby went out to the thrift shop and bought a new keyboard for about $5.00! I frequently shop at Goodwill for clothing, household items, etc. I found that for only $5 I can get a mailing of monthly coupons for $5 off if you spend $10. Shop in January for fantastic deals. People unload new, unwanted Christmas gifts, and older models of items they have upgraded. Also, people take advantage of the charitable contribution tax donation by donating by December 31. Our local consignment shops have been doing stuff-a-sack (Walmart sack) for $3. I have been hitting them for the past 3 months and have gotten some great stuff. I got a nice black leather bag for $1 at a thrift shop. You can tell leather from vinyl by the smell. Leather wears so much better. Many times they have a super sale like a bag of clothes for $5. I've bought new hooded sweatshirts for my granddaughter with 6 fitting in a bag. Recently, they had women's clothing for $.50 each. I realize that I do most of my shopping nowadays in various thrift shops. It's gotten to the point I get sticker shock when I go into a REAL store! When I am in thrift shops, I always look for little gift items - there are so many occasions to give little gifts - besides birthdays, there are get well gifts and so on. I shop at Goodwill regularly. I have problems removing the price off of non-clothing items like dishes, etc. The price is written in black directly on the item. I have tried soap, bleach, etc. and nothing works. Does anyone have any ideas? Thanks. As a former employee I can say the best thing to use is regular hairspray. It may take a couple of applications, work in a circular motion. I used to get so annoyed at the way things were marked. Tried my best to change it but they wouldn't budge. My thoughts were it ruins an item where it is placed, no one seemed to care. Just move the merchandise. My local store has even over priced it's way from being a thrift store. Is a shame the company has seemed to forget it's founding fathers and why it was created. Tips for getting the most out of thrift store shopping. Post your ideas. I go to the Goodwill on one-half off days (holidays or first Saturday of the month), as it makes my dollars go farther. I pick up things for my five grandchildren and others I know that are living on a minimum wage income. This way we all win--Goodwill, my family, friends, the people who donate to Goodwill, and myself, as I am helping others. Does anyone know how to get the ink mark off of the bottom of tennis shoes bought at goodwill?